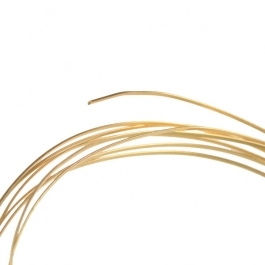 You'll find this half round red brass wire a staple in your wire collection because it can be used in so many types of projects - and because its golden hue adds a distinctive metallic touch to your jewelry. Half round wire is especially handy when it comes to creating a striking binding for cabochons or gem stones. Use it for flashy articles, from bracelets to rings to pendants. Or, it can be used in smaller, but no less important roles such as chain links. Half round red brass wire is available in a half hard temper, and it comes in three sizes: 18 gauge, 20 gauge and 21 gauge. It reacts well to soldering or oxidizing, lending a unusual vintage look to your work. Remember - if you can't find what you're looking for or have questions about jewelry supplies, we are here to help! Call Toll-Free 1-877-636-0608.